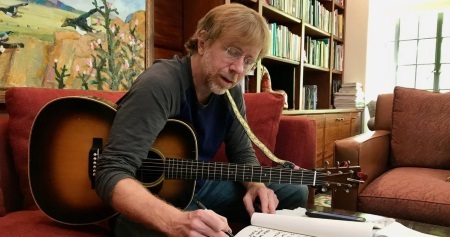 A new documentary about Phish frontman Trey Anastasio entitled Between Me & My Mind will have its world premiere at the Beacon Theatre in New York City on April 26 as part of the Tribeca Film Festival. A special performance from the Trey Anastasio Band will follow. Between Me & My Mind, whose title comes from the lyrics in the Phish song “Light,” was directed by Steven Cantor and produced by Jamie Schutz. Cantor’s resume features such documentaries as the Oscar-nominated Blood Ties: The Life & Work Of Sally Mann, the ESPN 30 For 30 effort Chasing Tyson about boxer Mike Tyson and the Emmy-winning PBS American Masters film Willie Nelson: Still Is Still Moving. The runtime is listed as 100 minutes.